Vail Christian's Sug Ellsworth is the Gore League's Player of the Year and a member of the Freud Five, which is actually made up of eight people. EDWARDS — Vail Christian girls basketball is creating offense, and Vail Christian boys basketball is playing defense. It’s a world gone mad, people. Welcome to the ironic juxtaposition that is Saints hoops. The ladies knocked off Shining Mountain, 43-22, busting through the magical 40-point barrier, while the guys toppled the No. 4-ranked Lions, 67-49, keeping the visitors under the equally magical 50-point mark on Friday at the Wheeler Athletic Center in Edwards. And all who were wearing blue and silver were very happy — and rightfully so. It is finals week for Vail Christian. Sophomore Remy Beveridge had chemistry on Friday. “It’s a lot more fun to play basketball than finals,” Beveridge joked. So Shining Mountain found out. The Saints led 20-12 at the half and never looked back. Subbing in for scratching and clawing and fighting is the motion offense. Vail Christian only broke 40 twice last season, and not until Jan. 17 against Lake County. Offense does start with defense, and the Saints do have the latter down pat, and that’s rebounding. Vail Christian (4-1) wiped the board clean against the Lions. That works, but rebounds on the offensive glass are also more opportunities. “Coach said whoever rebounds best is going to take it, so I guess we did,” Beveridge said. It was a rematch of state semifinalists in name only. After all, Vail Christian boys basketball’s starting five graduated last spring, while Shining Mountain featured only senior Alex Beal from last year’s adventures in the state tournament in Broomfield. 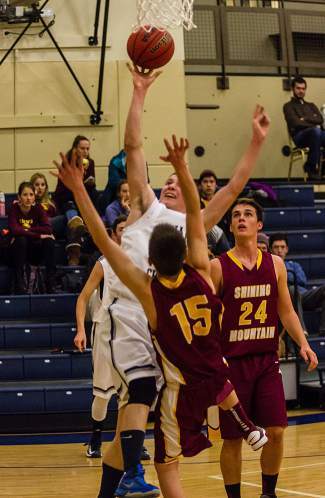 But Shining Mountain had thumped Vail Christian at this time during the regular season last year and entered on Friday with a shiny 5-0 mark and the No. 4 ranking in the state, so downing the Lions convincingly was definitely cause for whooping and hollering. “It’s a feeling of redemption after we lost to them last year at their place,” said Ethan Ellsworth, who had 15 points, but more importantly was a big factor defensively. Continuity seems to be a theme for this group, be it from being a part of a successful fall sport — football or golf — or a carry-over effect from last winter’s third-place state squad. Of note against the Lions is that the offense is coming from many places. Parker Poage had another big night with 18, including some strikes from way downtown. Cooper Gold also had 18, many of those well-earned in the paint. Vail Christian (4-1) led 35-18 at the half, and made strides as far as playing with the lead in the second half. Though the Saints probably weren’t as tight as they would have liked defensively, they did outscore the Lions, 14-13, in the third quarter,sending a message that there would be no comeback. Vail Christian is off until Jan. 10 when its squads head to Gilpin County.